The goal in the Ultra WEL is to water the soil deeply to an average plant rooting depth of about 12 to 24 inches, and then when the plants are fully established (2018) withhold water for 3 to 4 weeks in summer. (Since we added many new plants in November 2016, we'll ease into this strategy in 2018). Infrequent, deep irrigation should promote deep rooting. 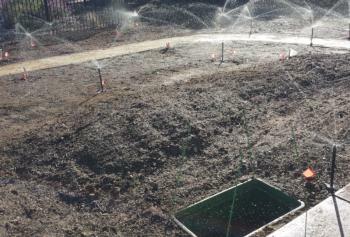 Sprinklers were chosen over drip irrigation to try to reduce repairs to tubing that gets cut, which have been a problem in the other WEL areas. However, because sprinklers were blocked by foliage even in year 1, and because of poor distribution uniformity, in October 2016 we retrofitted the sprinkler system to drip irrigation (1.0 gallon/hour, 12-inch emitter x 15-inch row spacing). The method we're using is called "line source" drip irrigation, in which the soil is uniformly wetted rather than simply placing emitters by plants. This works in a dense planting like ours, and roots of trees and shrubs will eventually grow where there are plant gaps. Such a design increases distribution uniformity to nearly 100% (our sprinklers were only 58%). 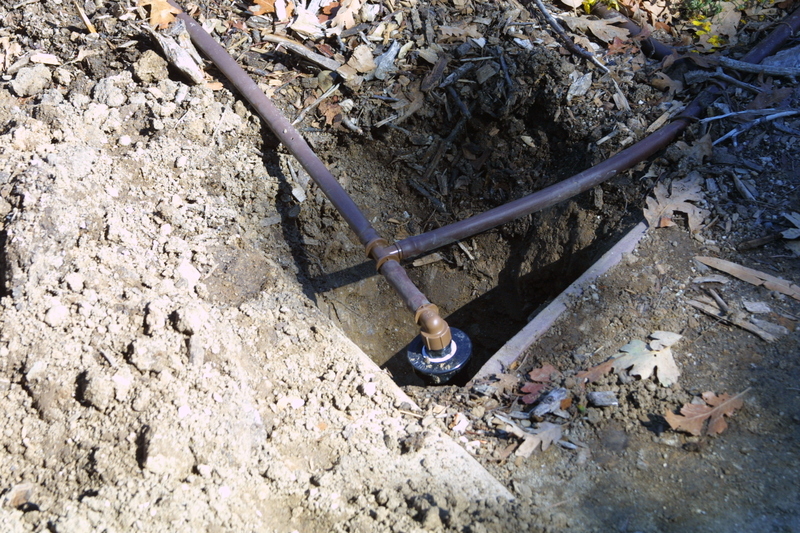 Line source irrigation also allows us to determine fairly precisely how much water to apply. With a simple formula, we determined that the new drip system will apply about 1.3 inches/hour, which is a lot of water! To view the formula, see page two of the handout (PDF opens a new window/tab) from the October 4, 2016 workshop below. Using a couple of other simple formulas on that handout, we can arrive at the run time for each irrigation - only about 20 minutes/week. But we plan to water very infrequently, so we'll most likely have to increase run time due to dryer than usual soil. Because the system is putting out a lot of water, we'll most likely use "cycle and soak", or two or more pulses of water separated by a couple of hours. Although this system will work, in retrospect a better strategy would have been to use drip tubing that was 0.6 gallon/hour, 18-inch emitter x 18-inch row spacing to save money on installation and reduce the flow rate. However, due to our sandy soil and many small plants that may not be close enough to an emitter, closer spacing was warranted. Getting it Right! 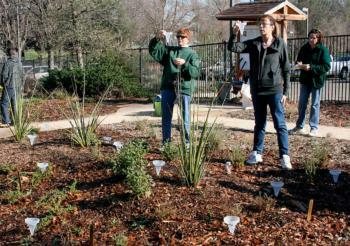 Drip Irrigation, Plant Selection, and Lowering Water Use workshop. Visit the link for handouts and more information on the irrigation systems for the WEL and Ultra WEL. This workshop was presented October 4, 2016 in Fair Oaks by UC Cooperative Extension and the California Center for Urban Horticulture. 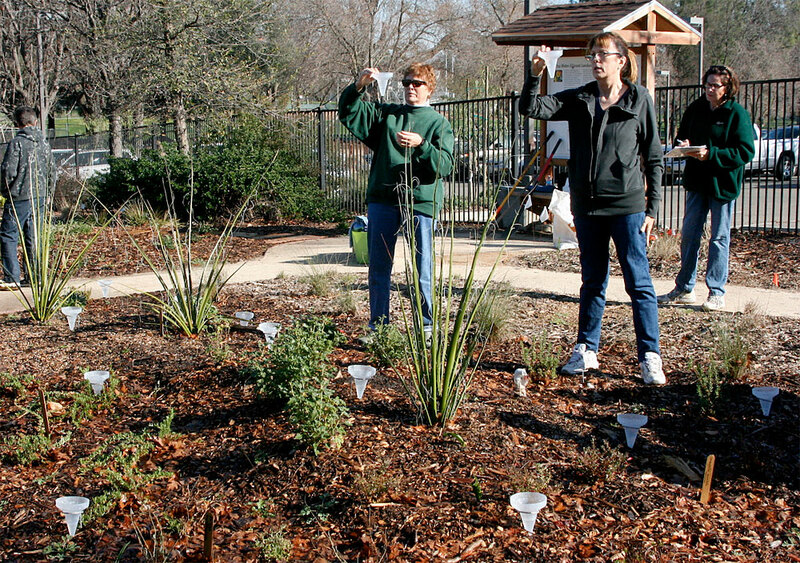 The 12-inch pop-up sprinklers should direct the water streams over the foliage. Although rotary nozzles provide fairly high irrigation uniformity (evenly distributed water over an area), all the sprinkler coverage areas need to overlap uniformly. We conducted a water audit in three planting areas of the Ultra WEL, and we found the average distribution uniformity was only 58%. 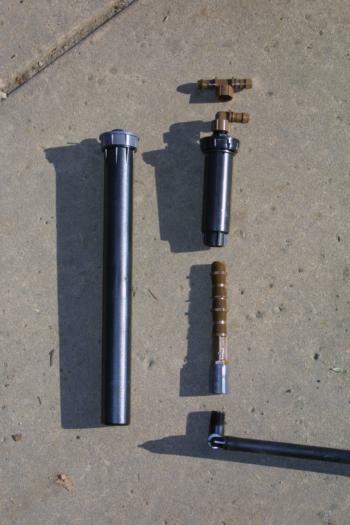 Parts used in assembling sprinkler retrofit to drip. An additional section of flex riser pipe (brown) was also added to bring the top of the head up to soil level. The barbed fitting on top can be either an elbow or a tee. The drip tubing connects to the assembled retrofit head. 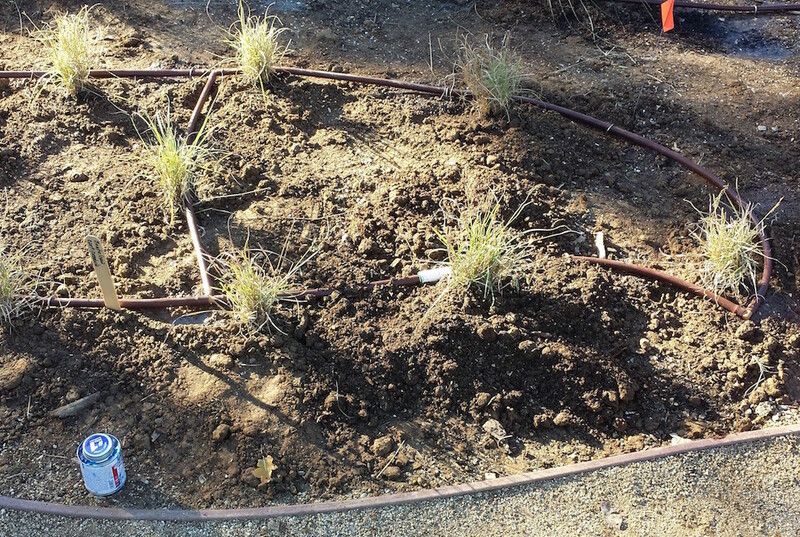 To accommodate the high flow through the drip lines, several retrofit heads were used in each planting area. The top cap and inside pop-up mechanism of sprinkler heads that were not retrofitted were removed and replaced with a fitted cap. 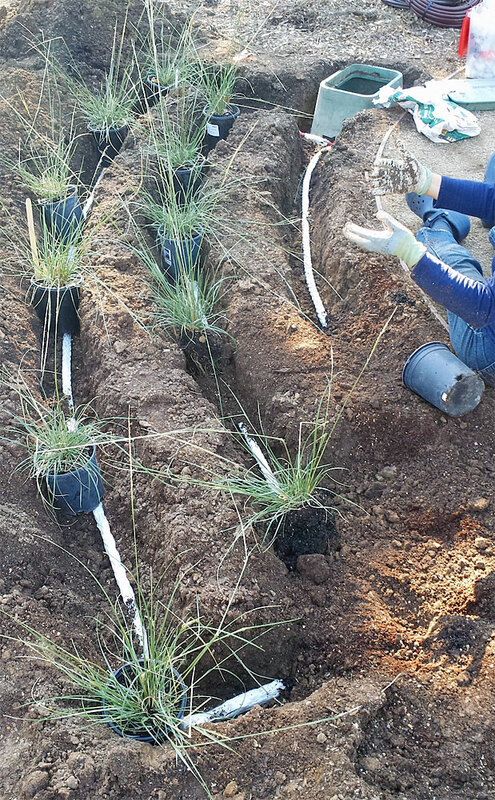 For the grass plantings, two different drip products were used (see examples below). Before cutting Eco-Wrap, duct tape must be wrapped to prevent the loosely wrapped strings from unwinding. Drip tubing with 0.6 gallon/hour in-line emitters spaced 12 inches apart was installed in one area. In another area, Eco-Wrap (Hunter Industries) tubing was used. 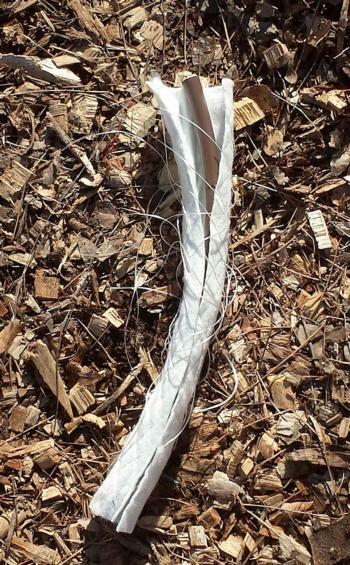 This is the same in-line emitter tubing but with a fleece material loosely surrounding the tubing that spreads out the wetted area. Eco-Wrap tubing allowed to unwind, showing the standard in-line drip tubing inside. 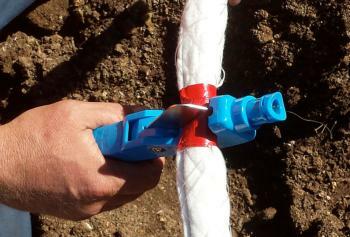 Eco-Wrap behaves like a soaker hose, but it delivers a precise amount of water. Eco-wrap is designed to be buried (ours is 8-10 inches deep and 18 inches apart), which results in virtually no water evaporation from the soil surface but makes it impossible to see and difficult to maintain. It is also difficult to know how deep the water is going - potentially beyond the root system - but that's true with tubing placed on the soil surface as well; in both cases using the water budget method (watering based on evapotranspiration [ET]) will prevent excess leaching. Eco-Wrap can also be used on the soil surface. It is available at many irrigation supply stores.